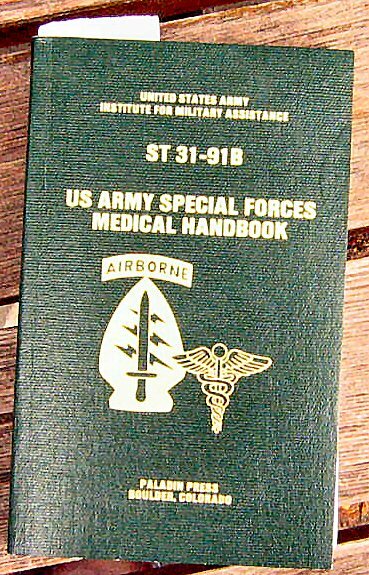 US Army Special Forces Medical Handbook ST 31-91B Paladin Press Boulder Colorada, by United States Army Institute for Military Assistance. This manual put out by the US Military makes for an interesting read. It presents many travel issues from a military perspective. I had found it to be accurate and comprehensive in its coverage of survival situations. Many similar books tend to be overcome by machismo bravado but I found this book to be very centred and straightforward on the subjects it covers without making any outlandish claims. I would recommend this manual for those planning extended outdoor or camping trips and wish to learn more about basic first aid.